Welcome to Market Cycle Dynamics for global investors and traders. Market Cycle Dynamics drive global financial market trends. The ongoing international crisis of excessive debt, overproduction and price instability is occurring globally and fueling currency wars. The often misunderstood economic long wave cycle is driving the global crisis. The smaller market cycles, including the business cycle and especially the Wall cycle, provide regular opportunities for investors and traders to buy and sell. Knowing where markets are trading in the cycles in price, time and sentiment reduces risks and improves performance for investors and traders. The MCD Letter also identifies global franchise large capitalization companies that pay dividends and offer discounted value opportunities at Wall cycle lows several times a year. 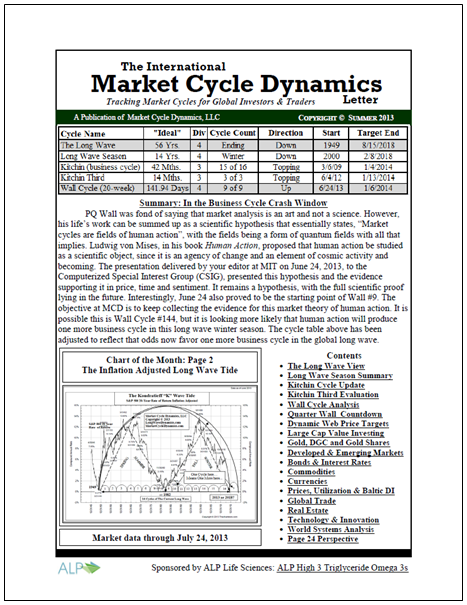 The International Market Cycle Dynamics Letter provides analysis of the key large and small market cycles. Subscribers in the U.S. and around the world receive the quarterly letter and access to online forecasting tools, and The MCD Monthly Briefing Blog, posted the first Wednesday of the month before 11:00 PM EST, providing timely market cycle analysis. 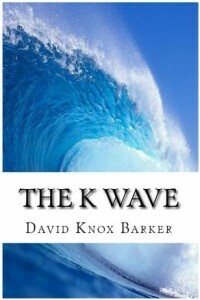 The K Wave; Profiting from the Cyclical Booms and Busts in the Global Economy (2012), first published in 1995 by McGraw-Hill, is an updated eBook on the long wave. The book provides a detailed review of the Kondratieff long wave cycle and current global market developments. The book contains dozens of charts that illustrate and provide evidence for the global long wave cycle and the smaller cycles. Investors and traders around the world are discovering the value of Market Cycle Dynamics (MCD) analysis. Visit What Subscribers are Saying for feedback on the market cycle tracking and forecasting found in every quarterly newsletter and monthly briefing.